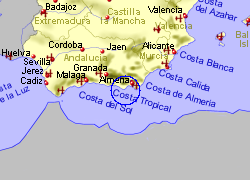 Situated 40 Km west of Almeria city, on the western side of a low peninsula, Almerimar on the Costa de Almeria must have one of the best climates in Spain. This is a modern purpose built resort and includes a large marina and a golf course. There are a generous selection of shops bars and restaurants, whilst for the more active, fishing , sailing, wind surfing and scuba diving are available. 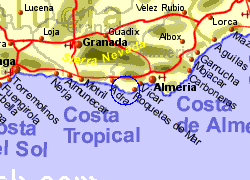 Whilst the location claims over 12 Km of wide sandy beaches, Almerimar is also within easy driving distance of the Sierra Nevada mountains and the Alpujarras, with the historic city of Granada being approximately 2 hrs drive away. 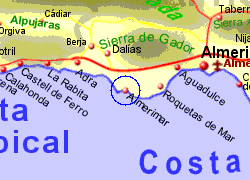 Map of the Almerimar area.